Luxury Yacht Victorian Rose is a 63ft Burger which has been meticulously restored by its current owners over the last three years, completed in the spring of 2009. Everything on board is brand new as she was rebuilt from bare metal. The attention to detail is incredible for this size yacht in this price range. Some of the features include; new Cherry inlaid floors, raised panel doors, fabric paneled walls with Sapele veneer panels. She has a cruising speed of 13 knots and only uses 20 gallons of fuel per hour at cruising speed so she is very fuel efficient and cheap to run. Sleeping four guests she is perfect for a family or a group of friends wanting to take a break in the New England area of North America during the summer or Florida and the Bahamas during the winter. 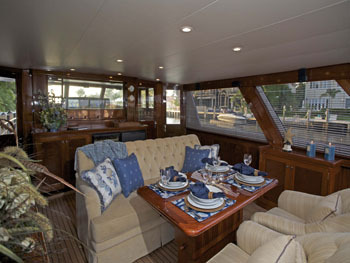 She has a beautiful and large master cabin with a centre queen and ensuite shower and head. 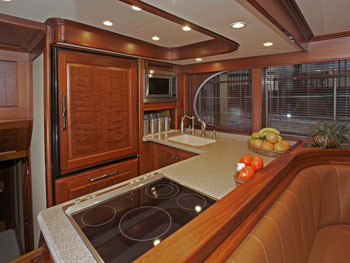 The master has plenty of storage space and a built in vanity area as well as flat screen TV and entertainment centers. 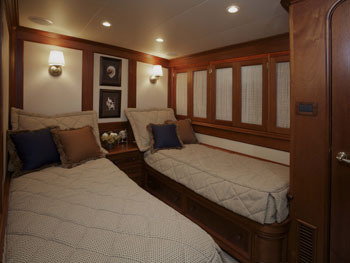 The twin cabin is forward of the master and also has an ensuite bathroom and TV and entertainment centre. 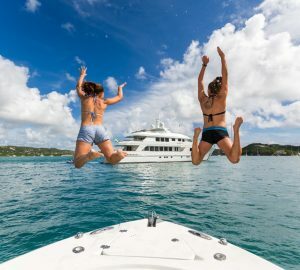 Victoria’s crew consists of three professional and attentive crew who are on hand to ensure everything is perfect and that every guest need is catered for throughout the charter. Sit back relax and let the crew show you New England’s beautiful waterways on Victorian Rose, a truly unique yacht to these waters and fantastic value for money. She has a stunning aft deck area which is perfect for enjoying the New England views and can be protected from the elements by Isenglass removable panels. 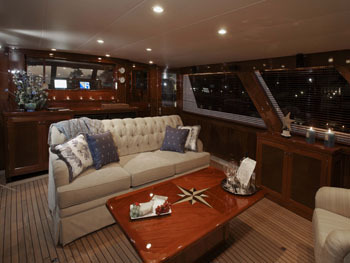 The aft deck has a wet-bar, hi-lo table, large flat screen TV with entertainment centre and surround sound as well as full air-conditioning. 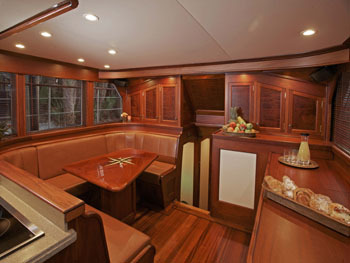 The dinette and galley area are forward of the pilot house and the open plan galley is the perfect place to relax and watch chef Sharon create you next gourmet meal. 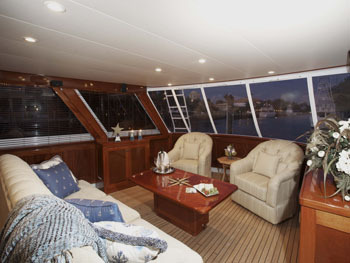 Luxury yacht Victorian Rose also has a huge foredeck which is perfect for relaxing and soaking up the sunshine during your luxury New England charter. 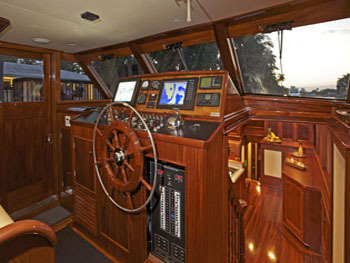 Overall Luxury Yacht Victorian Rose is a stunning yacht with beautiful wood detail throughout, not common on a charter yacht this size. She has a crew of three people and with only four guests this means that charter guests will be completely pampered and entertained. 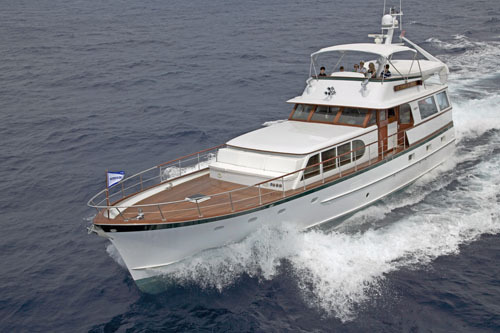 She is an excellent price for this quality, size and for the number of crew. Luxury power yacht Victorian Rose’s galley and dinette are forward of the raised pilothouse and aft deck salon is protected from the elements by Isenglass removable panels. The spacious aft deck has wet-bar, hi-lo table, a large flat screen television with entertainment center and surround sound. The whole yacht is fully air-conditioned. 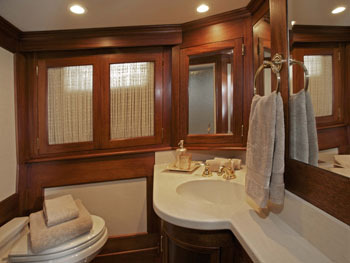 The elegant master stateroom is located below decks aft with center queen, built in drawers and vanity along port side, hanging locker and ensuite shower and head. 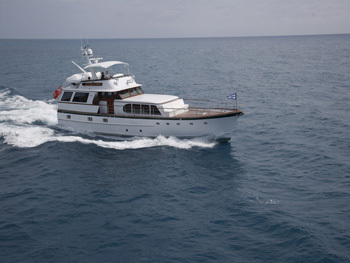 Twin guest is forward of master and also features a ensuite bathroom. 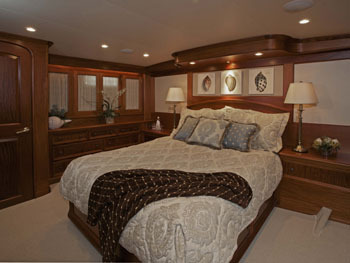 Both staterooms have flat screen tv's and entertainment centers. Victorian Rose has a 13ft tender with a 105HP engine. She is equipped with a tube for kids watersports and snorkeling gear. She has four flatscreen TVS and DVDs, Satellite TV, IPOD docking station, Xbox, WIFI, Satcom cell phone and VOIP telephones with Magic Jack.